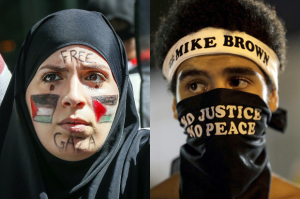 We discuss the growing synergy between African American and Palestinian activists in the U.S., and discuss the points of unity and tension within Black and Arab communities. We are joined by academic, author, and activist Dr. Steven Salaita; and the Rev. Dr. Heber Brown, community activist, Pastor of Pleasant Hope Baptist Church, and Executive Director of Orisha’s Cross Freedom School.